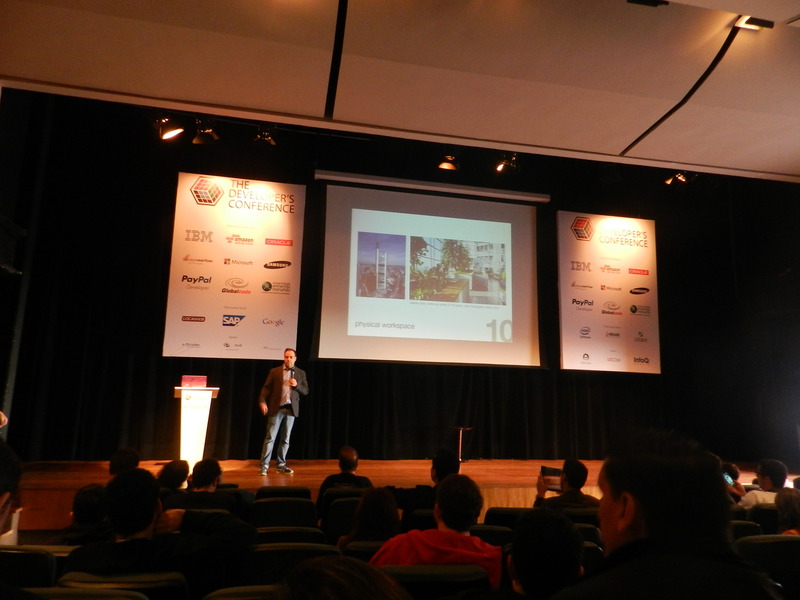 On August 6 (2014), I went to TDC (The Developer’s Conference) in Sao Paulo, Brazil. 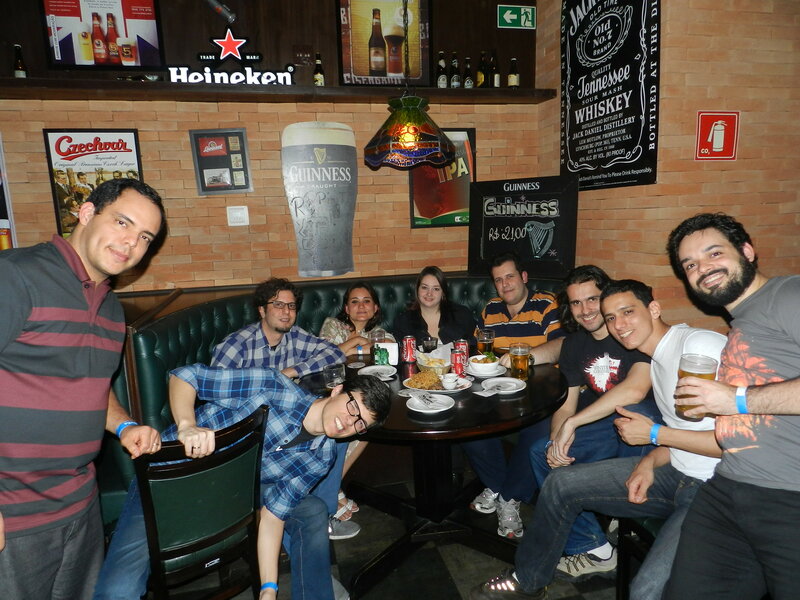 As one of the Stack Overflow in Portuguese moderators, I was invited by SO team itself, as they sponsored the event. 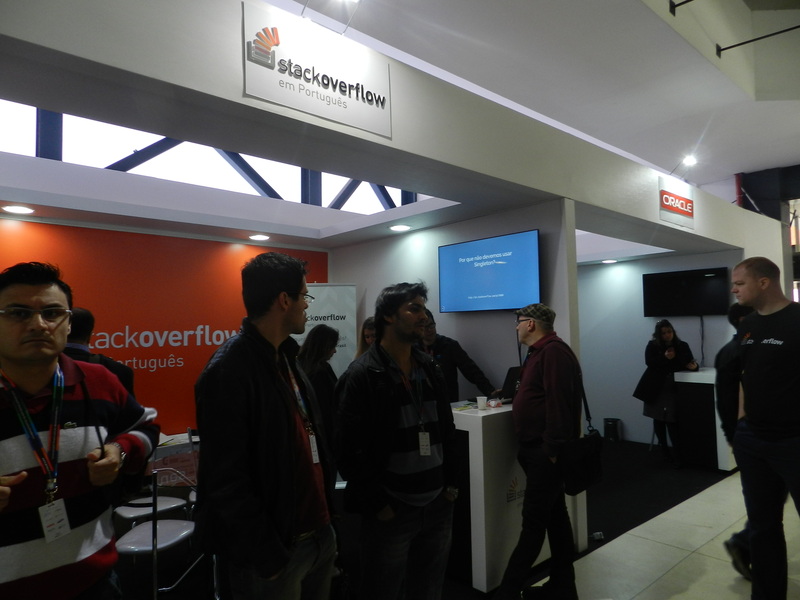 If you don’t know yet, the most essential site for developers, Stack Overflow, debuted this year its Portuguese edition. The goal is to provide useful and quality information, in its well known Q&A format, for millions of Portuguese-speaking programmers that aren’t very comfortable with English. 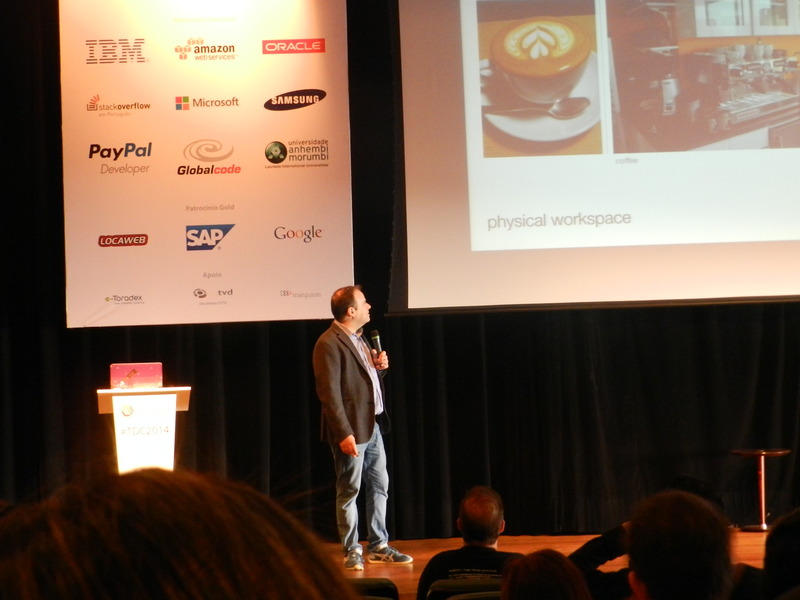 There were some very interesing talks and I highlight What Do Programmers Care About by Joel Spolsky, founder of Stack Overflow and of the acknowledged site joelonsoftware.com. He spoke about the challenge to find and retain talented programmers, highlighting a few characteristics that professionals seek in companies. One of the high points, in my opinion, was the idea that companies that try to save with tools and hardware pay a far higher price, since each delay in development process waste their more expensive resource: the developer time. If you participate of the hiring process in your company, I suggest strongly for you to watch another version of this talk available on YouTube. 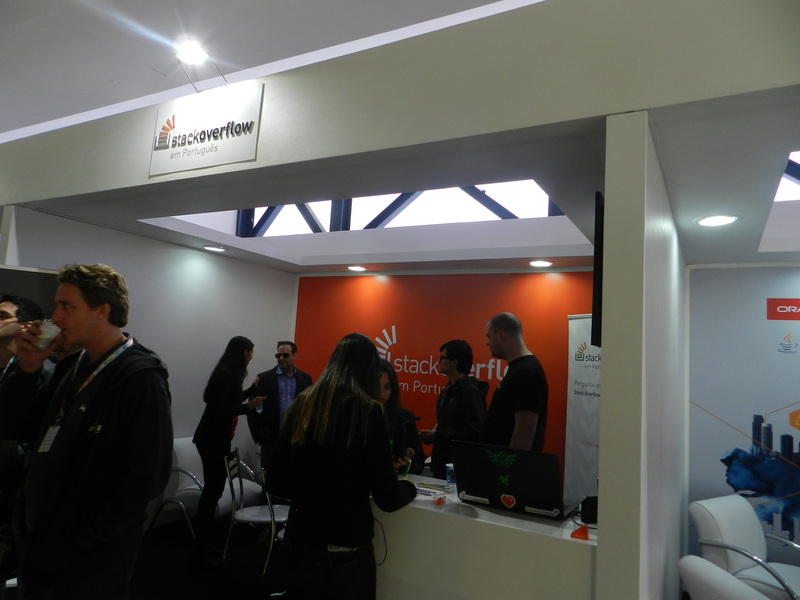 The most funny part of this event was meeting Stack Overflow team in company’s booth, as some SO users I knew only through the site, and many other people passing by. Have a look how busy they were in these photos! Actually, I believe this was one of the busiest booths. Those who arrived there early got t-shirts and other freebies, which unfortunately vanished very soon. 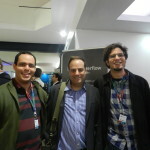 I talked fairly with Gabe, the Community Manager from Stack Overflow in Portuguese, who is the (guilty) responsible for the smooth progress of the Portuguese-speaking community. I’ve also talked a bit with one developer of the SO team, which was experimenting React.js and go language in a new project. I couldn’t help myself from taking a striking reminder of the event. 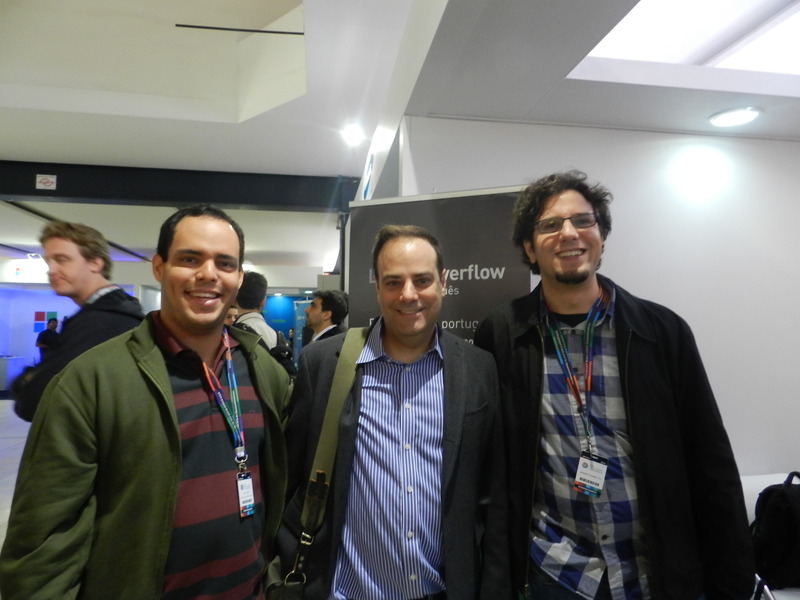 In the photo below, from left to right, you can see me, Joel and Bruno (the other moderator from Stack Overflow in Portuguese). 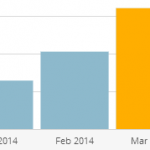 Stack Overflow in Portuguese went through private and public beta. 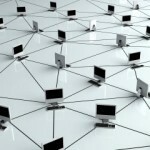 Participating of TDC, as one of the major IT events in Brazil, was a way to officially release the site, after its initial success. 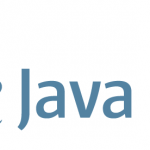 Problemas com “merge” no JPA?